Akata Witch by Nnedi Okorafor came out in 2011 with superb cover art by Jillian Tamaki, co-creator, with her cousin, Mariko Tamaki, of the award winning graphic novel This One Summer. 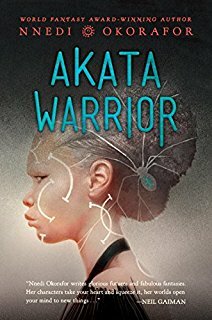 This year, in anticipation of the sequel, Akata Warrior, due out this fall, the amazing Greg Ruth created amazing covers for both books. I was working as a bookseller when Akata Witch came out and put it on my mental to-be-read list. And, while it took me six years to circle back to it, I am so glad that I did. In this post-Harry Potter world, it's hard not to read a novel about a child who discovers latent magical powers and goes on to fight evil without thinking about Hogwarts even a little bit. Akata Witch was published post-Potter and shares some similar elements (knives instead of wands, Lambs instead of Muggles, a funky train instead of the knight bus, an epic magical sporting match) with Harry's magical world and it was hard not to think of one realm while reading about the other. Okorafor's writing and world building is powerfully intense and I know that not a day will go by now when I don't think about and visualize in my head, an element from this story, whether it's chittim, the wasp artist that demands praise or the bridge to Leopard Knocks. Twelve-year-old Sunny Nwazue is lots of different things. She was born in New York but has lived in Nigeria since she was nine. Her features are West African, but she's an albino. She loves to play sports, especially soccer, but she has to stay out of the sun. Befriended by Orlu, a boy who lives down the street, she quickly learns not only is she a witch, but she is a free agent, meaning she is alone in the world of Leopard People and must educate herself quickly. One of the things I love most about this world that Okorafor created is the value - literally - placed on learning and knowledge. Chittim is the currency of the Leopard People and falls from the sky, earned by learning and performing spells properly. 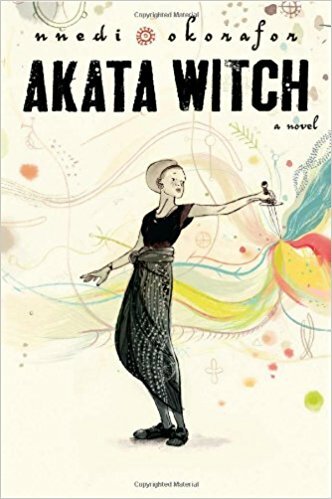 Sunny is mystified, nervous, scared and a little resentful throughout Akata Witch, both because no one in her immediate family is a Leopard Person so she was raised outside of their world and because learning magic seems to be a personal, trial-by-error experience without much guidance from teachers. An often repeated phrase in this book is, "Poor Sunny has no idea what we're talking about." Each child has a mentor and part of the excitement of Akata Witch is finding out who, or if, Sunny will get a mentor. But first, she has to cross the frightening bridge into Leopard Knocks, the magical, magically protected and concealed city for witches, and discover her spirit face, an important part of working her magic. As Sunny builds her friendships, learns magic and what her magical gifts are, she moves between two worlds - the Lamb world of her family and the magical world of the Leopard People - ultimately discovering that her gift is the ability to move between worlds. Sunny, Orlu, Chichi and Sasha quickly learn that their talents and strengths, in spite of their ignorance and egos, are strongest when used together. And, together they are told by the elders that they have been called upon to stop Black Hat Otokoto, a Leopard Person who has been killing and maiming children as part of his plan to summon a powerful, evil force. The final battle where the four friends take on Black Hat is only slightly more intensely memorable than the grand gathering of Leopard People where Sunny witnesses a death in the magical wrestling ring and shows up a bunch of boys in a magic-free soccer match. 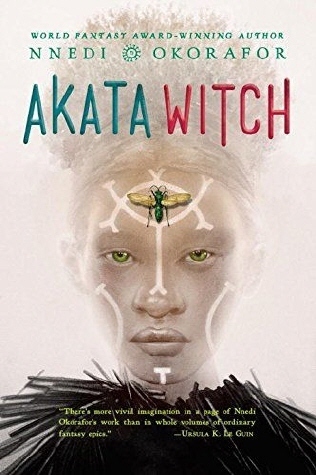 Akata Witch is a fantastic read and I can't wait to encounter Sunny again, a little wiser and a littler older and a lot more powerful, in Akata Warrior!